This is my second post of canvaswork for Catherine of Hillview Embroidery. 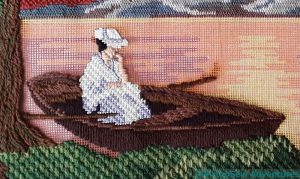 The Lady By The Lake has a much wider range of stitches and threads in it, including blends of stranded cottons, ribbons, and a variety of wools. 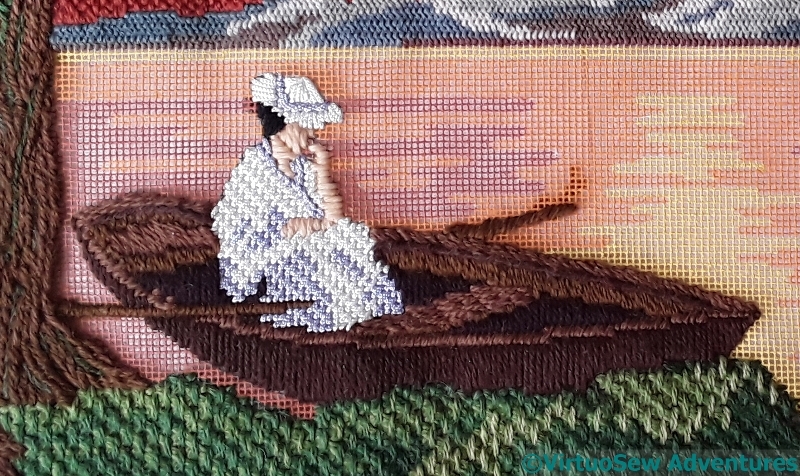 The canvas is a double thread canvas which makes it possible to separate the threads and work some of the design in petit point. 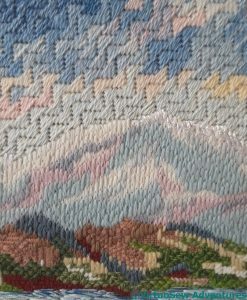 The sky and clouds are all Milanese Stitch, worked in blended Persian yarns with three strands in the needle. 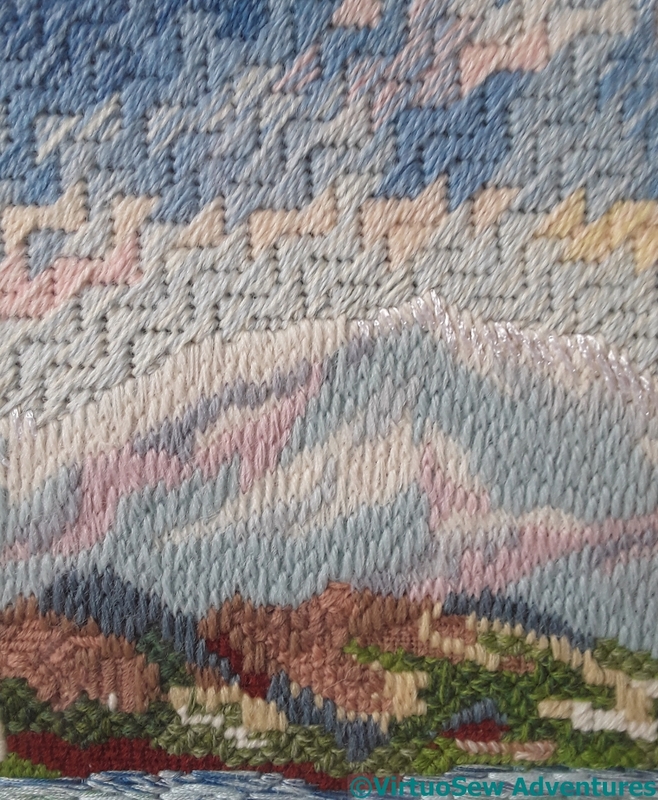 The mountains are in Gobelins Stitch in tapestry wool, and the lakeside hills with their forest and villages are a whole tangle of interesting variations of stitch and thread. 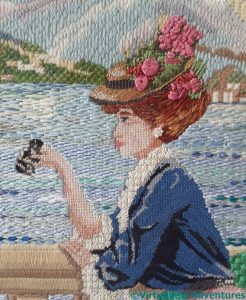 The face and arms were worked in petit point, separating the double threads to create single thread canvas, and worked in stranded cottons (blended). 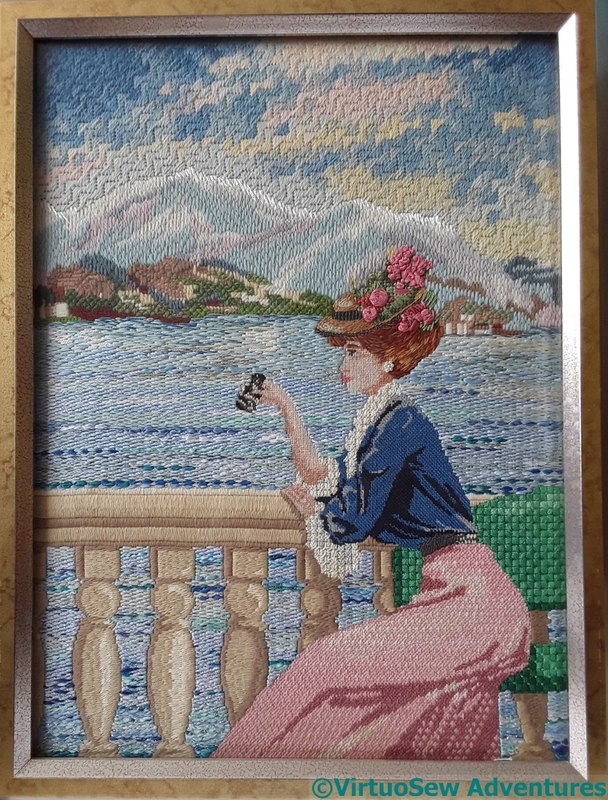 The hair (she didn’t have quite such glorious chestnut hair on the painted canvas itself) is also blended stranded cottons, worked in a sort of long and short stitch. The hat has spider’s web stitch roses on it, and she’s wearing large pearl bead earrings. It was the idea of experimenting with the skirt that attracted me. 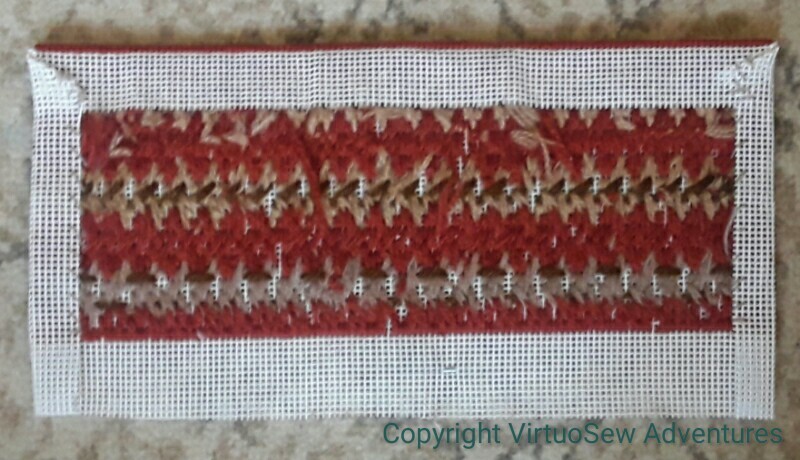 I used a bordered Hungarian Stitch, worked in three shades of pearl cotton and combining them to create the impression of five shades in the skirt. It worked! 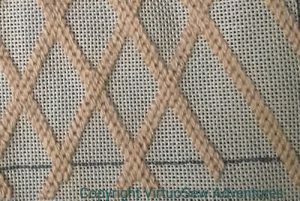 The blouse is also pearl cotton, this time Linen Stitch, which is effectively the back of Basketweave Tent stitch put on the front. I changed the wooden, slatted backed bench of the canvas into a padded one so that I could do the upholstery in Reversed Mosaic Stitch. 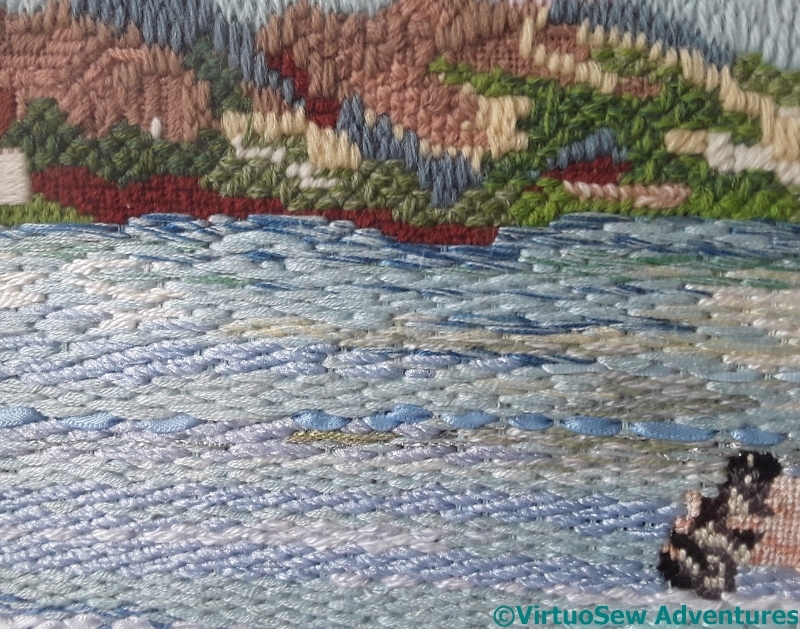 The lake itself took ages to do – row after row of darning stitch using all sorts of ribbons and threads, including some truly ghastly double knitting acrylic yarn which would have made a dreadfully uncomfortable jumper, but made a very good lake surface, with that slight sparkle you get when there’s just enough breeze to move the water. 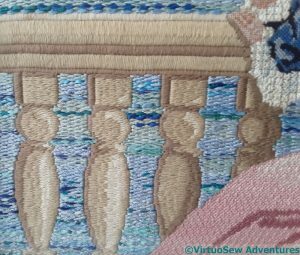 The balustrade was worked in Soft Embroidery Cotton. I assumed it was something like limestone, and not marble with a polished surface, so the thread needed to be dull to let other elements shine. Again, click on the pictures to see more and have fun thinking about what I should have done differently! 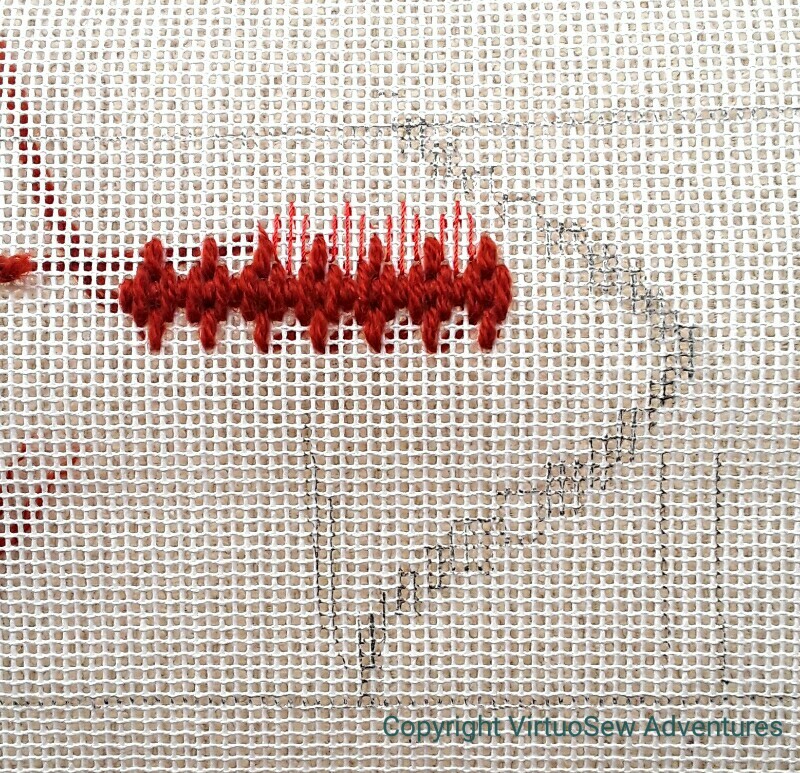 Catherine, of Hillview Embroidery, is doing an RSN canvaswork course at the moment, and commented in a recent post that the folder of photographs of the work of past students at the back of the studio has been really useful, partly for ideas, and partly just to practice analysing designs and stitches. 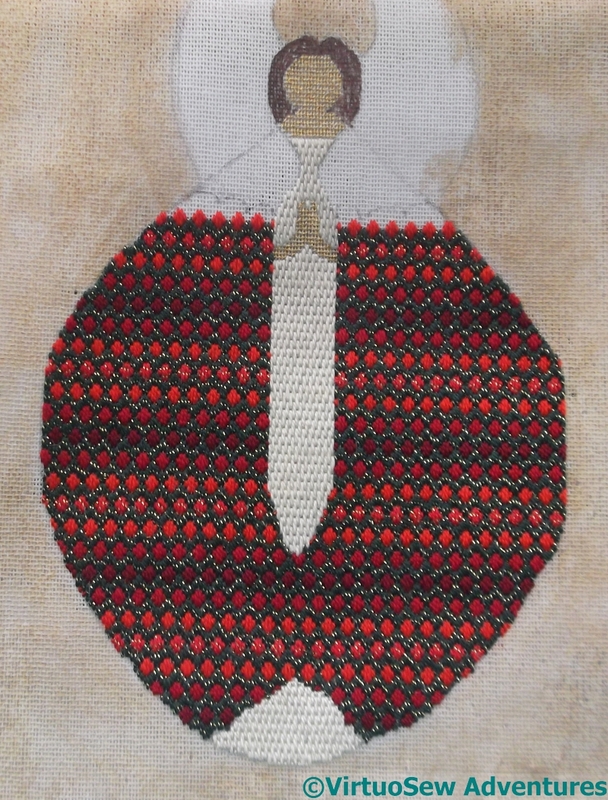 I have two canvaswork pieces that use ornamental stitches to represent the textures and colours they depict, both worked when I was a teenager. It’s much easier to analyse someone else’s work than your own, so Catherine, this post (and another, as yet unwritten) is for you! It was actually the sky that made me buy this particular painted canvas (this was long before I’d tried designing my own!). 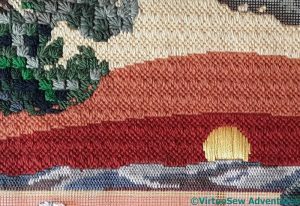 I think the stitch is Hungarian Point, and since the canvas had such a graphic feel, rather than being painterly, I was quite happy to leave the sky with those sharp colour changes. 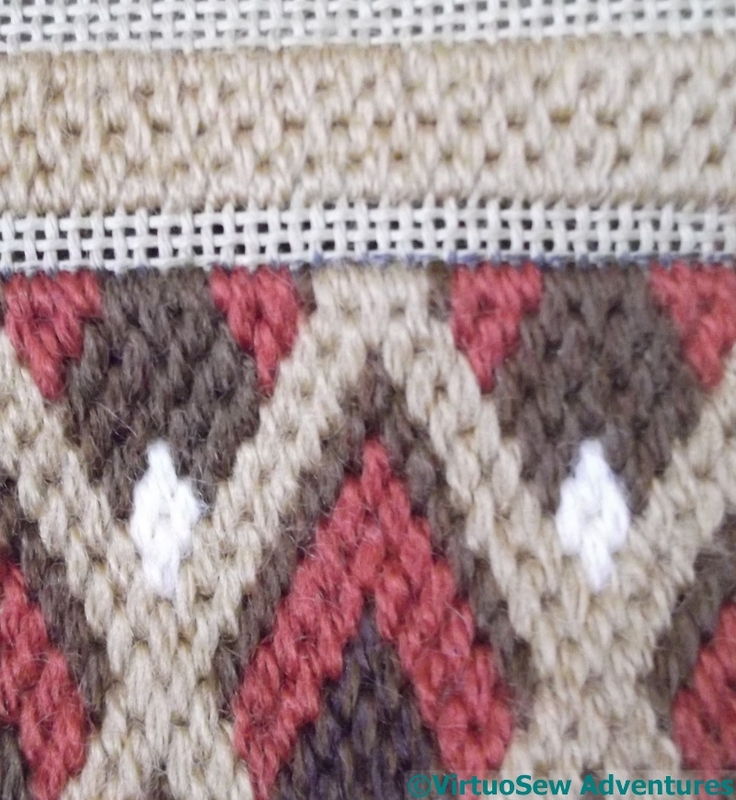 The pattern in fact runs clean through from bottom to top, but that those same colour changes mask the fact. 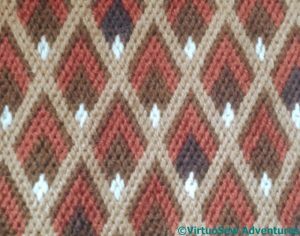 The heather clad hills are in Plaited Stitch, worked small to help them recede. 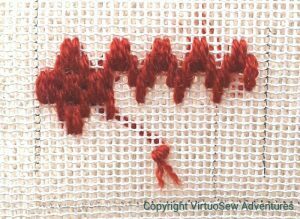 And the foliage of the tree is Ray Stitch. 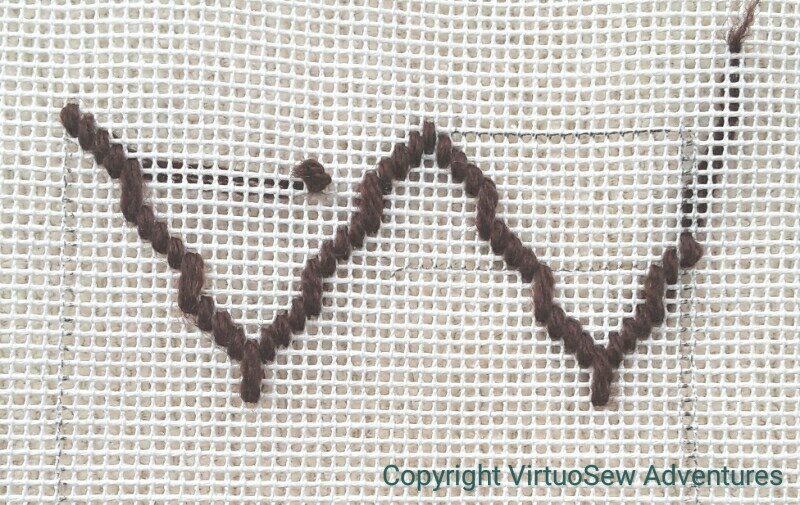 I do wonder whether I should have done the ray stitch facing downwards, but some of the pines have a slight upward curve, so they are staying as they are. 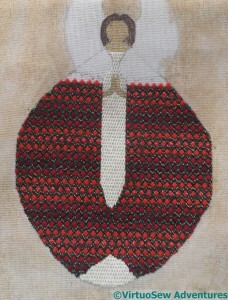 Almost all the threads in this piece were wool. It’s a fairly large gauge canvas, and again, there’s so much flat colour that blends wouldn’t really be suitable. 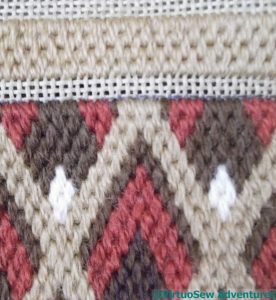 The lady in the the punt is Soft Embroidery Cotton for her skin and hair, and tubular synthetic for her gown and hat, and the punt is straight stitches in assorted browns. 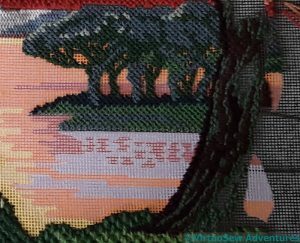 The tree trunk is effectively in stem stitch, and the bushes at the front are interlocking elongated cross stitches. They look surprisingly bushy, don’t they! The trees in the distance are in Upright Cross Stitch, which makes a good intermediate texture between the bushes at the front and the distant hillside. And that near tree? That’s one of the reasons I didn’t finish. 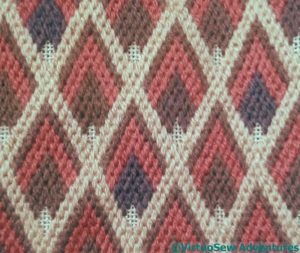 I found that not only was I not enjoying the combination of stitches, I was running out of the threads and colours I was using. I threw it in the loft in frustration and disgust and only fished it out again after I’d read Catherine’s post. The sea is another reason. I still haven’t worked out how to do it, and at the moment, I am still not at all sure I want to. You can click on all the pictures to see them more closely, so Catherine, your homework is to look at them all, think about what you like and what you’d have done differently. And if any of you have any suggestions for the sea – let me know! When I’d finished the stitching of the canvaswork for the Form Cushion, it was a little puffy and warped, and badly in need of blocking, but being long and thin I had nothing suitable for blocking it on. Until I had an inspiration – use the form itself! 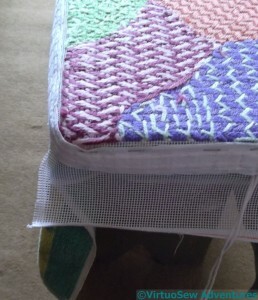 We covered the form with an old towel, and then worked on alternate sides of the form. 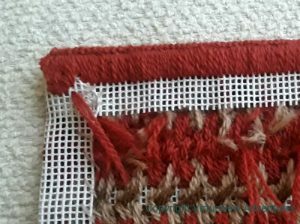 I’ve put an old length of cotton curtain header over the canvas, so that when I come to remove the staples, it will be fairly easy to do. It took quite a lot of heaving and tweaking, and the combined efforts of my mother and myself (for a client, she’s having to put a lot of effort in here, isn’t she! – she’s started on renovating the form too. 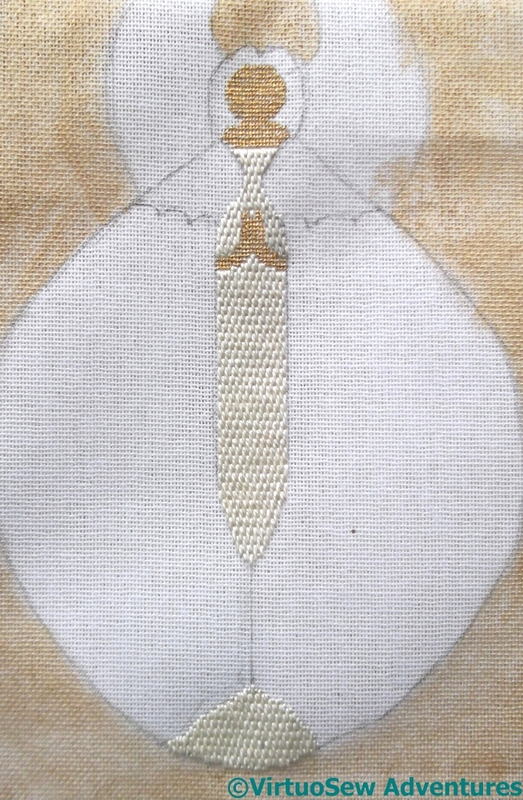 ), but in due course we managed to get the canvas firmly attached, and stood back to look at it. It didn’t look nice and smooth as it does here. It was bumpy and lumpy, and not very happy at all. 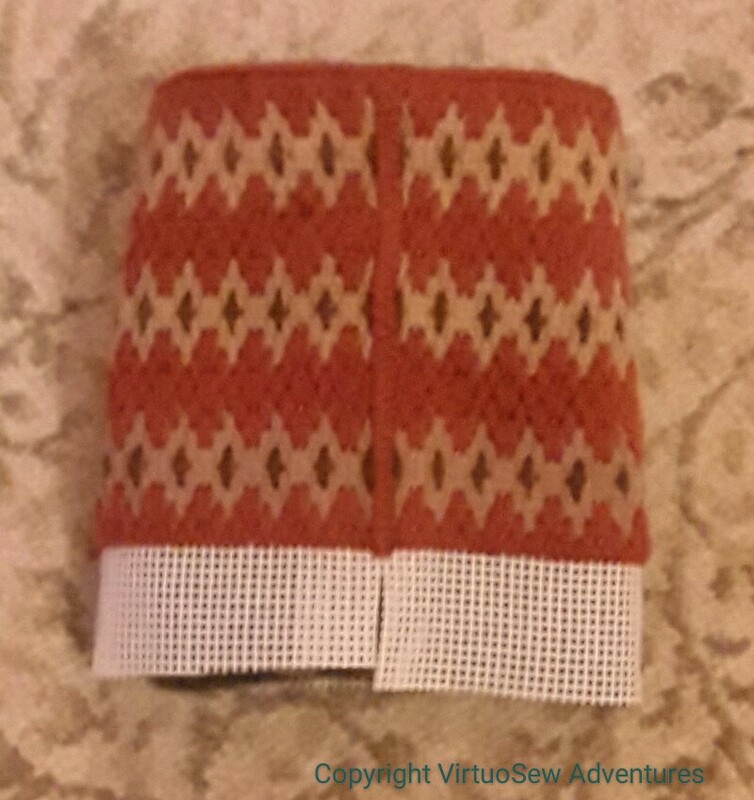 So I steamed it gently, using a steam iron but not letting it touch the wool. Very, very carefully, and slowly.. It started looking a great deal better (even upside-down), but then we set it aside, still stapled in place, for a few weeks. 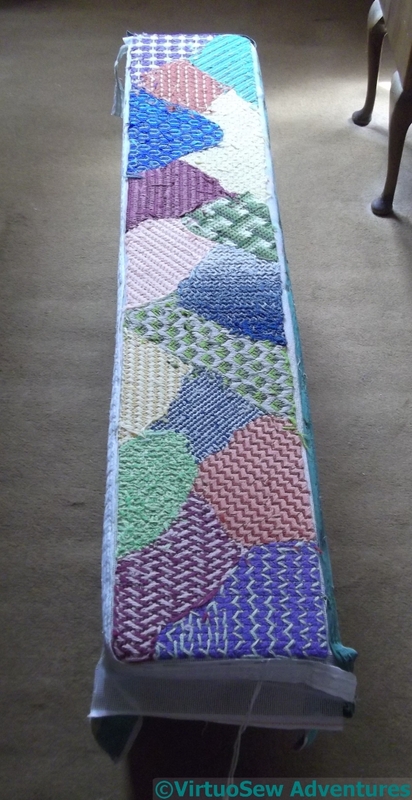 We wanted to be sure that it was very thoroughly dry before we moved on to actually making the cushion. And besides, I’m not entirely clear on the type of cushion it will be! There is always more “engineering” involved in these projects than you expect. Once I’d turned in the edges and done the herringbone stitch “piping”, I realised that the top of the bin was probably going to be on show on the inside. I found some felt to line it with, but since it was a spare offcut, I decided to run a line of straight stitches on the inside, just in case there wasn’t enough of it! 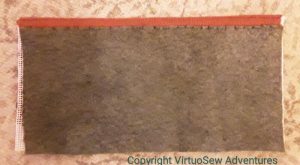 I attached the felt with small stitches, not too tightly, but just enough to make sure that it doesn’t move unless I want it too. It’s almost a pre-felt, not too dense, so it showed some adventurous tendencies. Some firm treatment, a tug or two, and it settled down nicely. Which allowed me to consider tackling the seam turning it from a flat piece to a tube. 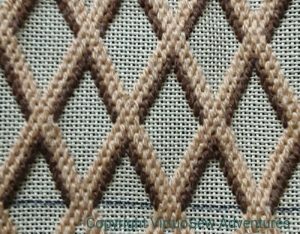 After some of my usual thoughtful staring, it finally occurred to me that I already had the answer: Herringbone stitch, just like the edge finish at the top. Obvious, really, isn’t it! 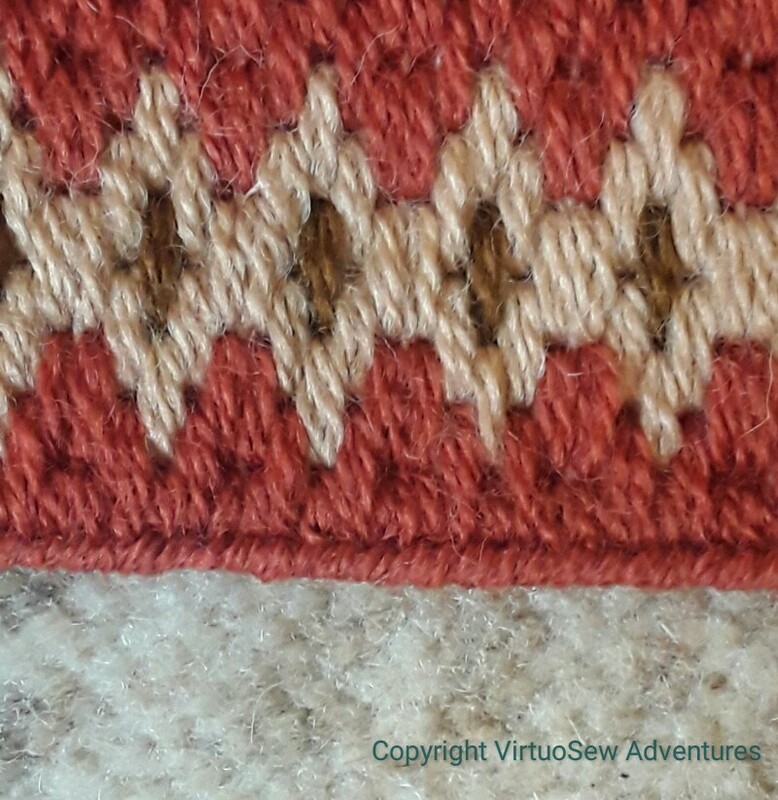 It makes a sturdy seam which won’t permit much lateral movement, and since I’ve used it on the top edge, it doesn’t introduce yet another texture. 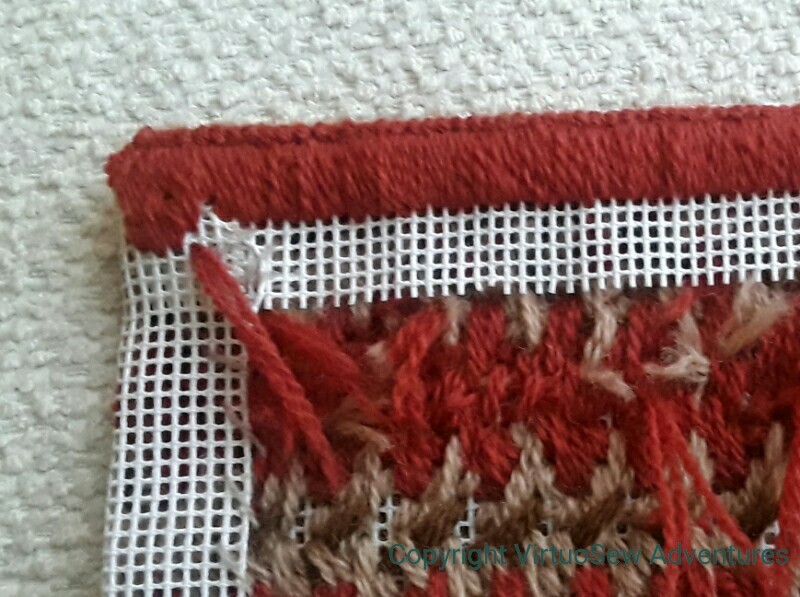 When it came to sorting out the base, I put the sawn-off milk bottle inside to make sure I made everything fit, and folded in the canvas, holding it with a few rough stitches. Finally I attached a piece of very dense felt to the bottom to hide all the canvas edges and make sure they don’t scratch any of the furniture. It is already in use, and you have to admit it’s very much better than an unclad sawn-off milk bottle would be! 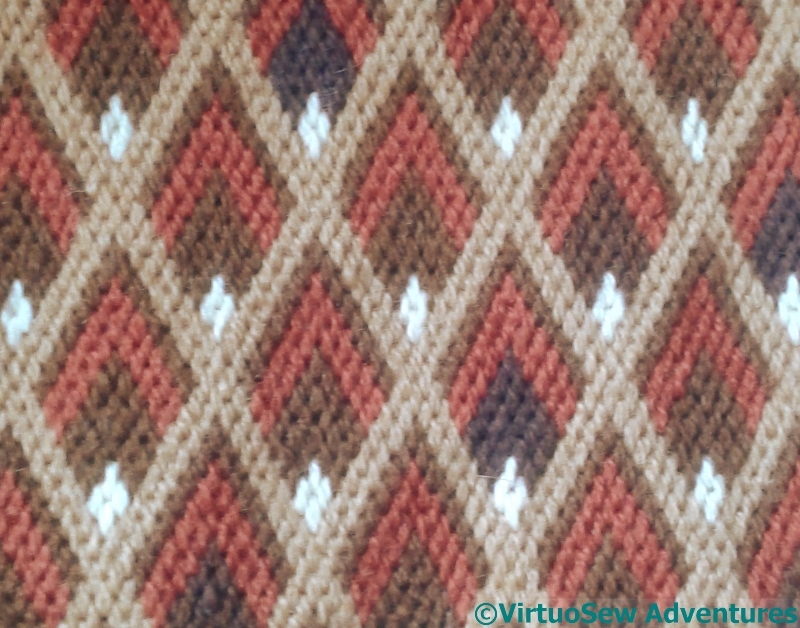 Once I’d settled on a pattern, it fairly romped along. 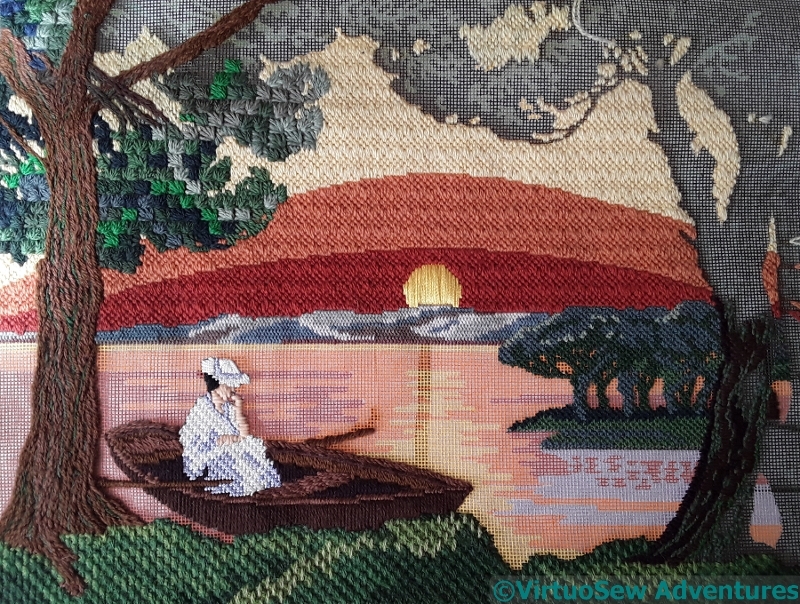 Ten count canvas is such a lovely rest after the forty count linen of Eve In The Garden Of Eden! 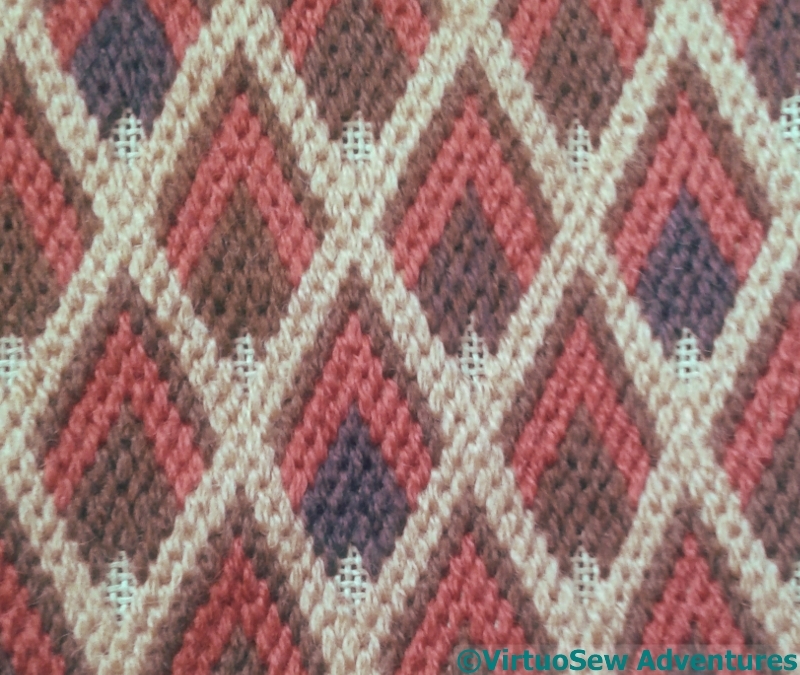 As with the Crazy Canvaswork Cushion, I’m not buying extra wool for this, hence the row of light stitches which aren’t the same shade as the other two. 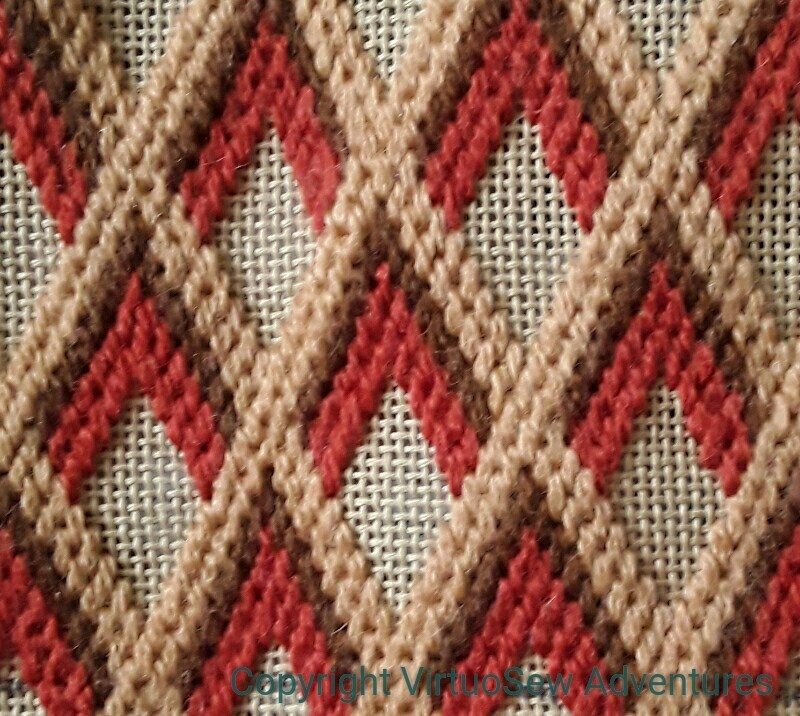 Most of the thread is Paterna Persian Yarn, but the odd one out is Appletons. The texture and level of shine are different, but then, anything will be better than a sawn-off milk bottle! The next stage is to turn in three of the edges. 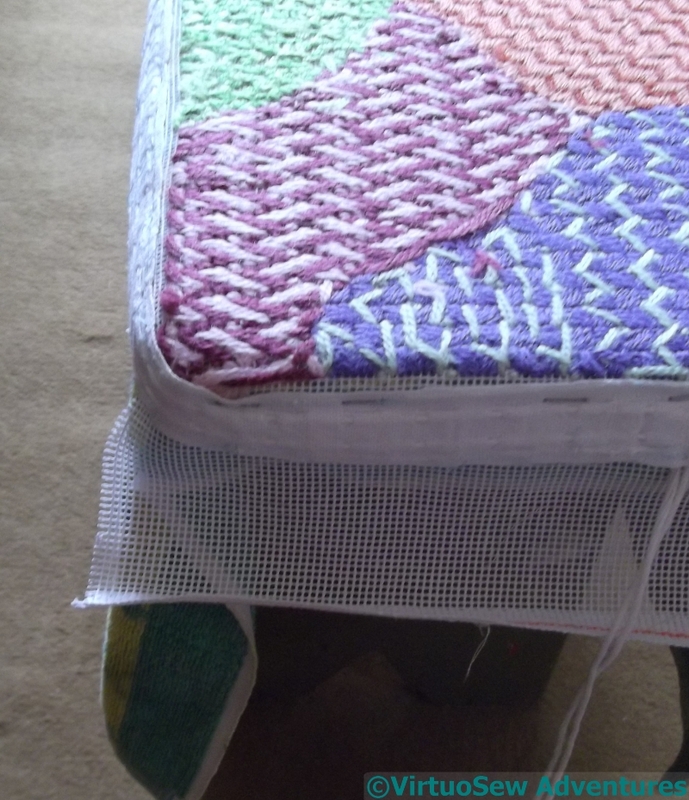 I’m going to use the canvas at the bottom to help create the bottom of the bin, so I’ve left that, but the short edges will be seamed together – somehow (I’ve not solved that puzzle yet!). 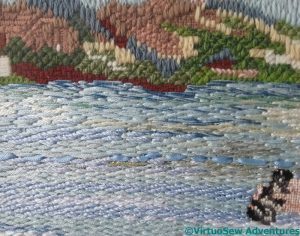 I’ve learnt, over the years, that it is better to finish the folded edge of a piece of canvaswork than it is to try to fold the edge to be completely invisible. 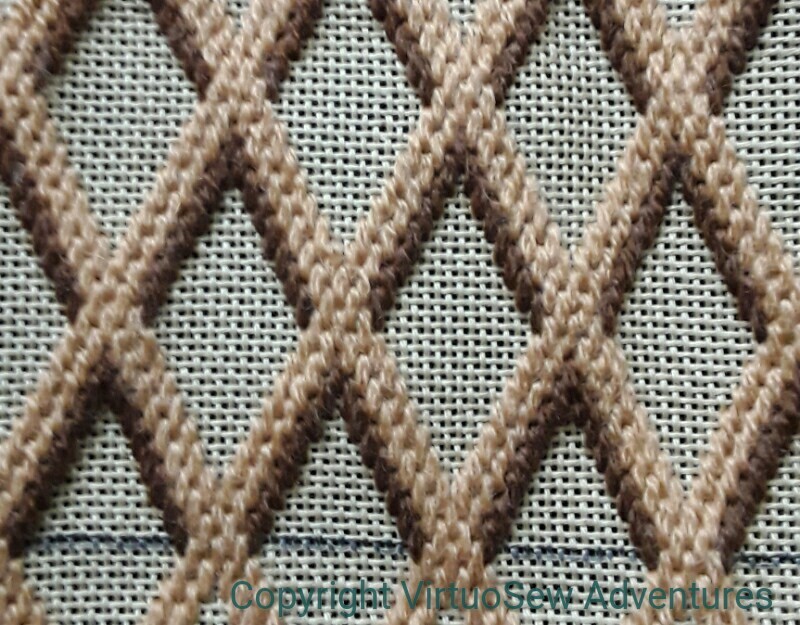 So what will be the top edge of the bin has now been finished with herringbone stitch. 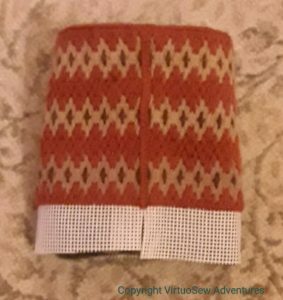 It creates a lovely piped effect, much denser and firmer than a simple overcast stitch, and that will be very useful to help the bin stand up! 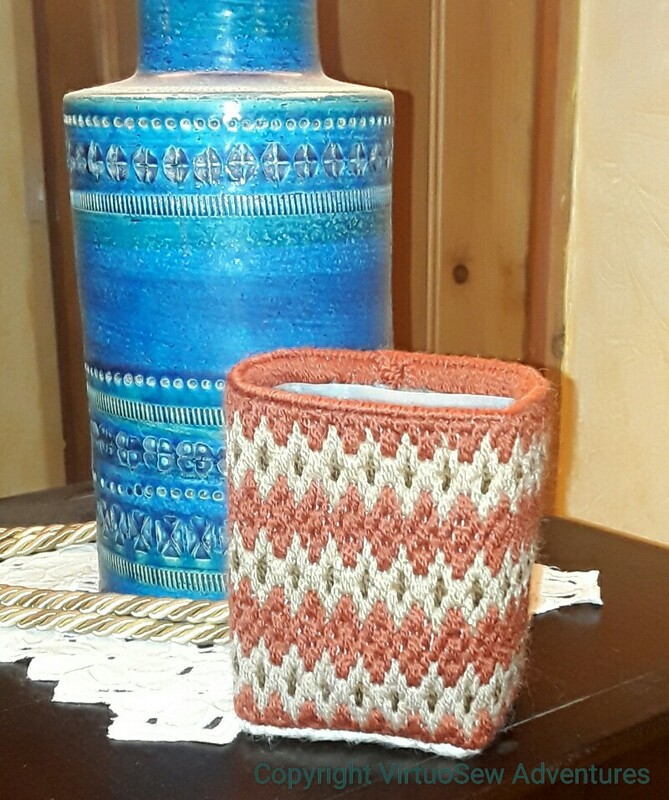 I have a small plastic bin – cut down from a milk carton – on the worktable beside my chair. It’s very useful for odds and ends, but it scarcely adds to the ambience. Since all my embroidery at the moment – “Eve in the Garden of Eden”, and something I’m planning for “Dreams of Amarna, but haven’t quite got ready for stitching yet – is fine and detailed, I’ve decided to work a cover for it in bargello work. I’m using another of those offcuts of 10-count canvas. Ideally I would use something finer, but since I want a rest for my eyes, and in particular to use up some more of that persian yarn, I’ve been playing with various patterns in an old book. 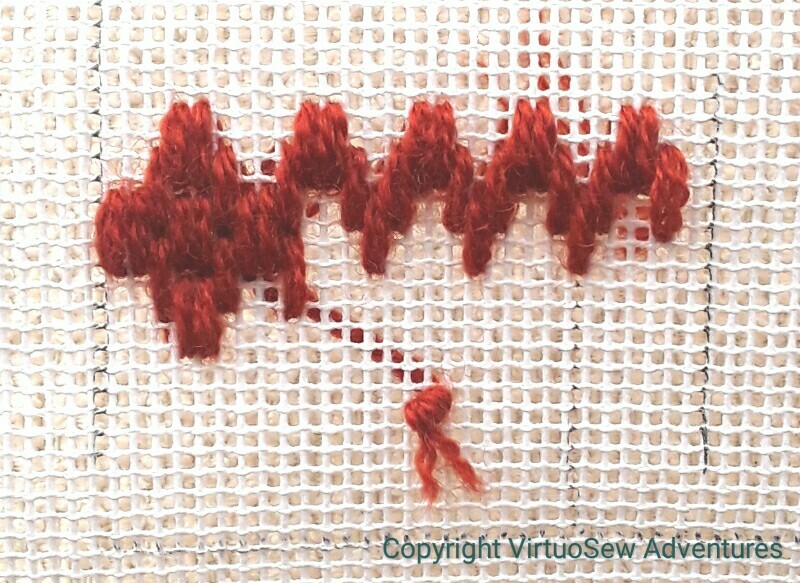 In this case, one pattern drawn on, and the other stitched, partly in wool, and partly in a fine silk, just to help me with stitch placement. 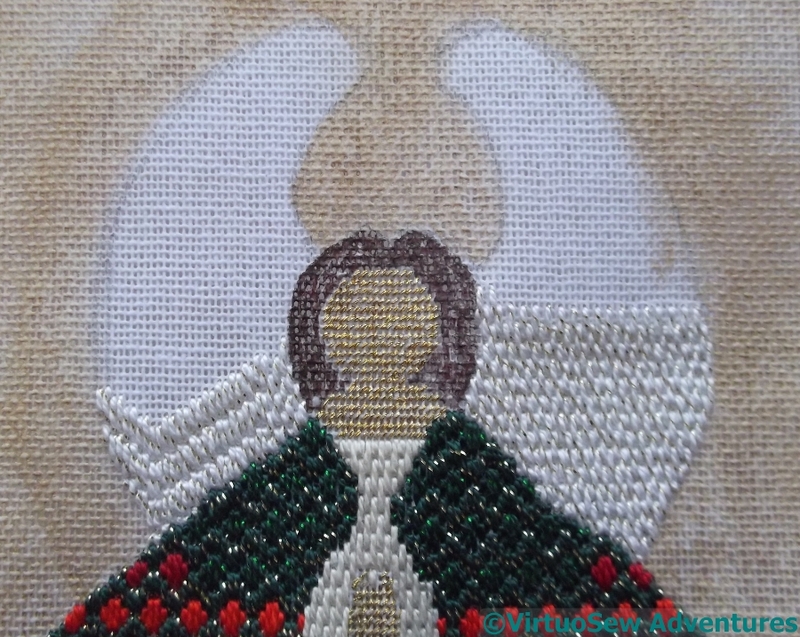 Rather than being stitched in time for Christmas, I found myself stitching the Christmas Angel over Christmas. 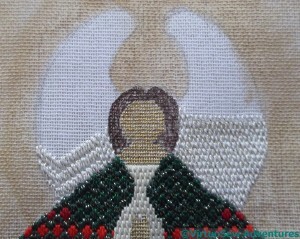 About halfway through the stitching, I also coloured in the hair with brown pen. It helps keep the head distinct from the background and the wings, and somehow pulled the whole thing into focus. 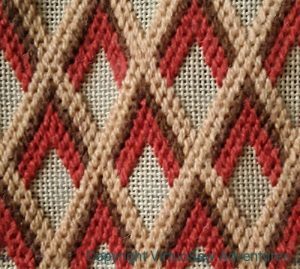 My invented bargello pattern of various pearl cottons, including some with a metallic twist in them, has turned out fairly well, if redder than I expected. 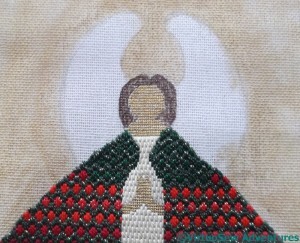 As a result, I chose to stitch the shoulder cape in greens. 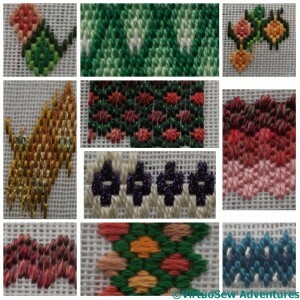 There are two variants here – green with a gold thread and green with a bright green thread. I’ve been using the green and gold as the striped “framework” for the Cape, so I simply used the green and green for the spots. 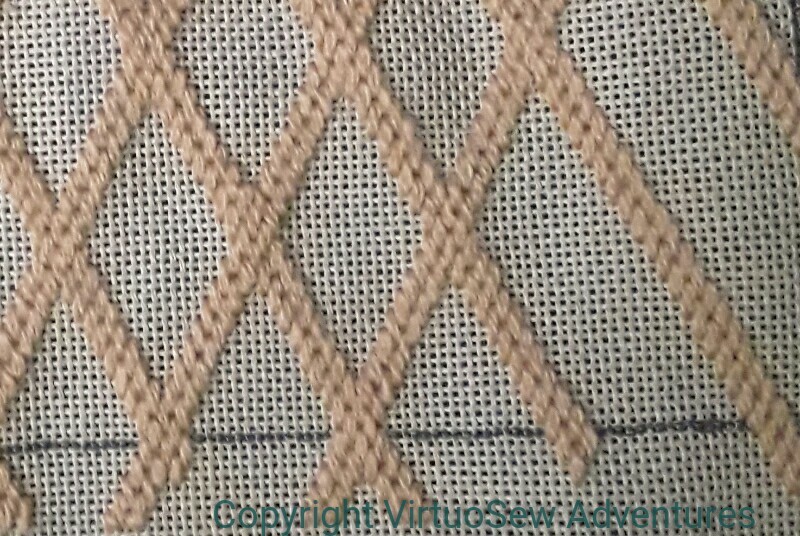 The shoulder cape will be outlined to allow for a bit more shaping, using couched gold thread, but that’s one of the last elements of the design. The next challenge was to decide how to work the wings. I started off wanting to create some sort of strong patterning, just with the stitches, but in the end I realised that, as the background is going to be strongly patterned, and the cape is so striking, the eye will need somewhere to rest. 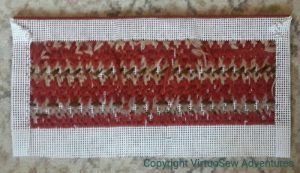 So, plain brick stitch it is, although in another of those glitter-twisted pearl cottons, which are quite ridiculously tender and tricksy to stitch with, at least on this canvas. Even Gilt Sylke Twist and Gold Wyre seem robust by comparison! While I am still trying to work out how to do the Chorus of Angels, I’ve decided to work a single Angel from the Chorus in an entirely different medium – needlepoint. 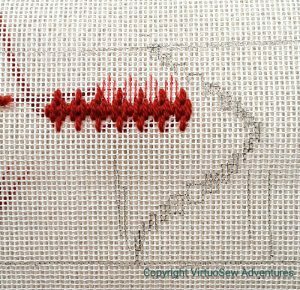 The original idea was to have it done by Christmas, but I’m becoming aware that that isn’t very likely now. Once I’d made that decision I had a lot of fun playing with bargello patterns and trying to choose something suitable. I’m using a fine canvas – 18 count, I think, although as it came, unlabeled, in among that collection of supplies that included several frames, I’m not sure. 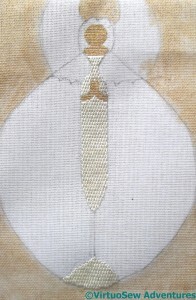 It’s full of size and is going to be rather a trial to stitch, I fear. I’ve decided to use the gold pattern on the far left (slightly altered) for the background, to give an effect a little like the patterned gold background of an icon. The lines of this panel are so simple that I can afford to use some quite complicated patterns, I think. In the end I settled on the green and red spots in the upper middle for the cape, although choosing the colours hasn’t been quite straightforward. The wings are still puzzling me. Since I have decided on a gold background for the angel, I decided to paint the background canvas gold as well. That will help to boost any thin coverage. 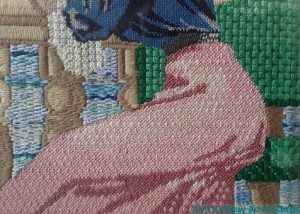 I’ve worked the gown underneath the cape very simply, in cream brick stitch, and the face and hands using gold tent stitch. None of the variants of flesh colour seemed right, and the gold does at least belong in the design.